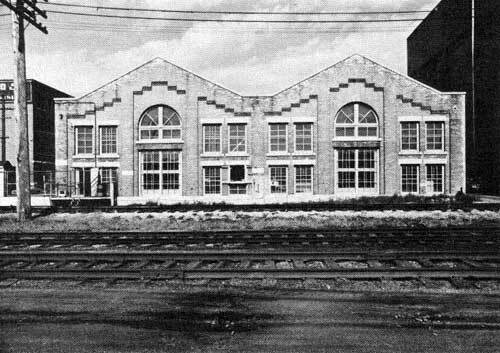 James Avenue Pumping Station from the river side in 1930. Not long ago, in the early years of the twentieth century, fire was a constant danger in the climate of long, cold winters and wood frame buildings. Many private and commercial structures were heated by coal-burning stoves, or boilers with inadequate safety devices. But the greatest problem in combating a fire was the water supply. Winnipeg obtained its drinking water from a series of artesian wells. This water was pure and sufficient for routine use, but could not be supplied in the high volumes needed to fight a serious fire. Frustrated firefighters might hook up their hoses to nearby hydrants and find a mere dribble of water where a blast was required. Advances in structural technology at the turn of the century meant that new buildings could be taller, compounding the problem of inadequate pressure. A major downtown fire in 1904 nearly got completely out of control and threatened to destroy two blocks of Main Street. Even the emergency back-up pumps of river water could not compensate for the effects of a chemical explosion and high winds. “Enough!” cried the insurance underwriters, who increased their lobbying of civic politicians to remedy the situation. In 1905, City Council responded by announcing plans for a high pressure water system for fighting fires, the James Avenue Pumping Station. Opened in 1907, the station is a low brick structure located by the Red River behind the Centennial Concert Hall. Its plain brick exterior disguises the massive equipment within its walls. Its pumps sucked water from the river and pushed it through a separate grid of pipes and special hydrants buried beneath downtown Winnipeg streets. Its operating boundaries contained the commercial district, with the most valuable properties. Three hundred pounds of pressure, a huge volume of water, were available for prolonged use in an emergency situation. This new system was independent of the domestic water supply. Besides the actual pumping station we see today, there was also a separate structure where coal was burned under pressure to produce a gas fuel for the pump engines. As well, there was a huge brick vat to store the gas. When natural gas, and later electricity, became the power source of the engines, these two ancillary structures became redundant and were demolished. Flywheels and pistons of the station interior. In contrast, all of the original equipment installed in the main building in 1906-07 is still there. The massive generating and pumping equipment, supplied by manufacturers in Scotland, England and the United States, is fully functional. Large, arched windows facing the river side admit sunlight to the interior of the pumping station, reflecting off the polished stainless steel of the oversized pistons, the grey painted steel of the motors, and the glittering glass and brass of the gauges and controls. So heavy and massive is the machinery that it is all at grade or below, and it was lifted into place by overhead cranes that form part of the steel frame of the building. In fact, the pumping station was constructed around the equipment, which was too large to fit through any doors. Troughs to drain the backwater were sunk in the murky depths below the equipment. Within seconds of a call from the fire department the operators started the machinery, which was transformed quickly from a group of sleeping giants into a whirring, lurching, pounding harmony of sound and motion. Building up water pressure and driving it through the lines, the water was released from its special hydrants into the firefighters’ hoses, which were calibrated to reduce the impact. This was not the minimalist self-effacing technology of the 1980s at work. It was, instead, the unbridled power manifest at the height of the industrial revolution, with all its pride and punch. 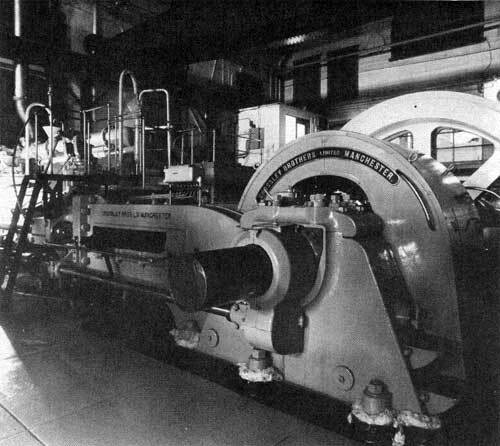 Operated initially by the British mechanics who moved to Winnipeg to install the machinery, the James Avenue Pumping Station performed its vital function in fighting fires for eight decades. During that time, it was converted to draw water from the Shoal Lake aqueduct line rather than the river, and electric engines were brought in to power the pumps. While the pumps are now started electrically, the gas generators were maintained in the event of a power failure, so that in appearance, the equipment is much the same as it was upon installation. Some of the equipment has been cannibalized to provide parts for other engines, of which there were originally six, and in later years the maximum pressure could no longer be achieved. Pumper fire trucks, in effect water tanks on wheels, augmented the high pressure system and eventually replaced it. This high pressure water system for firefighting was one of only two known to exist in North America; the other one in the United States closed down some years ago. Effective in its purpose to the end, the James Avenue Pumping Station was closed by the City of Winnipeg in the fall of 1986. Its massive equipment is still operational, but long-term maintenance problems and changes in firefighting methods precipitated its closure. While the opportunity for using the station as a resource in interpreting and exhibiting our industrial past has excited heritage agencies, the future of the brick building and its impressive contents is uncertain.